Heat oven to 350°F. In large bowl, stir cookie mix, butter, egg, flour, hazelnuts, cranberries and 1 1/2 cups chocolate chips until stiff dough forms. Shape half of dough at a time into 8x2 1/2-inch rectangle on ungreased baking sheet. Bake 20 to 25 minutes or until golden brown. Cool on baking sheet 15 minutes. Cut crosswise into 3/4-inch slices. Place slices, cut sides down, on baking sheet. Bake 10 to 12 minutes, turning once, until crisp. Remove from baking sheet to wire rack. Cool completely, about 20 minutes. In small microwavable bowl, microwave 1/2 cup chocolate chips on High 30 to 60 seconds; stir until smooth. 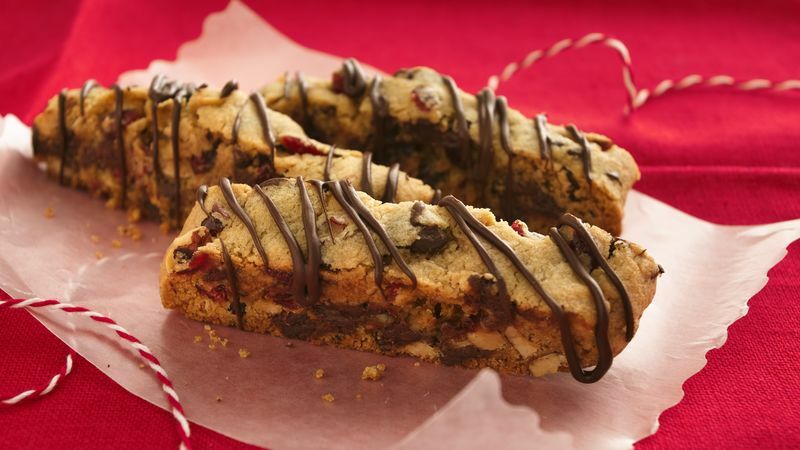 Drizzle chocolate over one side of each biscotti. Let stand until chocolate is set. Special Touch Need a gift for a coffee lover? Pack biscotti in a latte cup or small basket with coffee beans. Success To soften butter, microwave unwrapped butter in glass bowl or measuring cup uncovered on High 10 to 20 seconds.